Freud in Zion tells the story of psychoanalysis coming to Jewish Palestine/Israel. 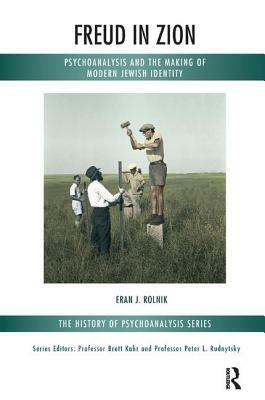 In this groundbreaking study, psychoanalyst and historian Eran Rolnik explores the encounter between psychoanalysis, Judaism, Modern Hebrew culture and the Zionist revolution in a unique political and cultural context of war, immigration, ethnic tensions, colonial rule and nation building. Based on hundreds of hitherto unpublished documents, including many unpublished letters by Freud, this book integrates intellectual and social history to offer a moving and persuasive account of how psychoanalysis permeated popular and intellectual discourse in the emerging Jewish state.